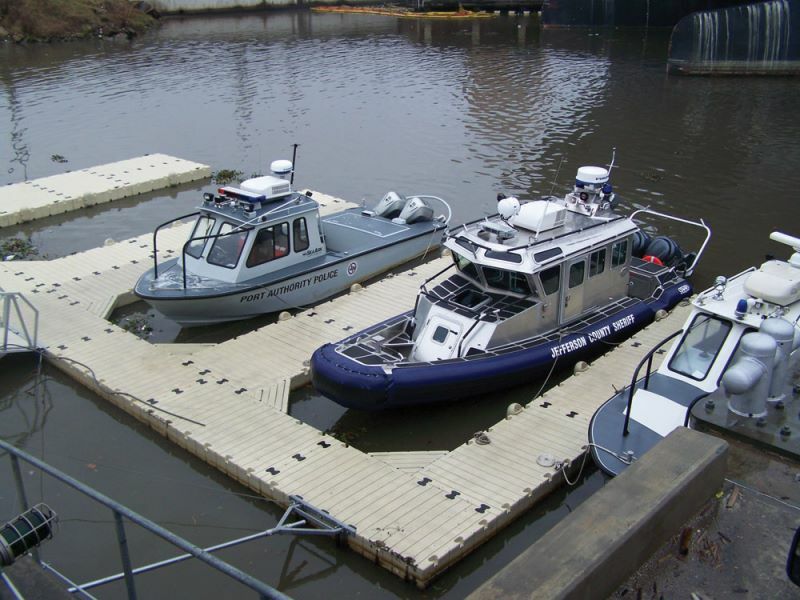 These are the most frequently asked questions relating to our EZ Dock floating dock system. How long will it take to get our new EZ Dock? All EZ Dock products are in-stock and ready to be delivered. Most docks can be delivered and installed right away so you can begin enjoying your dock immediately. Can the dock be installed, or will I have to do it myself? EZ Dock can deliver and install your dock for you. You can also install it yourself. Most docks can be installed in a day or two with just you and a helper. What special tools are required to install EZ Dock? A coupler installation tool (about $40) is the only special tool that you will need to assemble the EZ Dock sections. A hammer, ratchet, 15/16" socket, coupler socket tool (provided with couplers), and a phillips head screwdriver is all it takes. Consider the fact that the EZ Dock design eliminates up to 60% of the components that other manufactured dock systems need for assembly. It takes only one connection point to make twenty feet of EZ Dock, versus up to seven connection points on ordinary systems. It really is simple and EZ! And, the sections can be assembled on land or in the water. What is inside of EZ Dock sections? The EZ Dock one-piece sections contain no fillers or foam for floatation. Their uniquely engineered design forms chambers that displace water and trap air for buoyancy. How hot does EZ Dock get under the summer sun? The light color of EZ Dock helps keep the deck surfaces cooler than just about any other deck surface. Shade Structures can always be added to EZ Dock. What about Ultraviolet Radiation (UV) exposure in the summer heat? 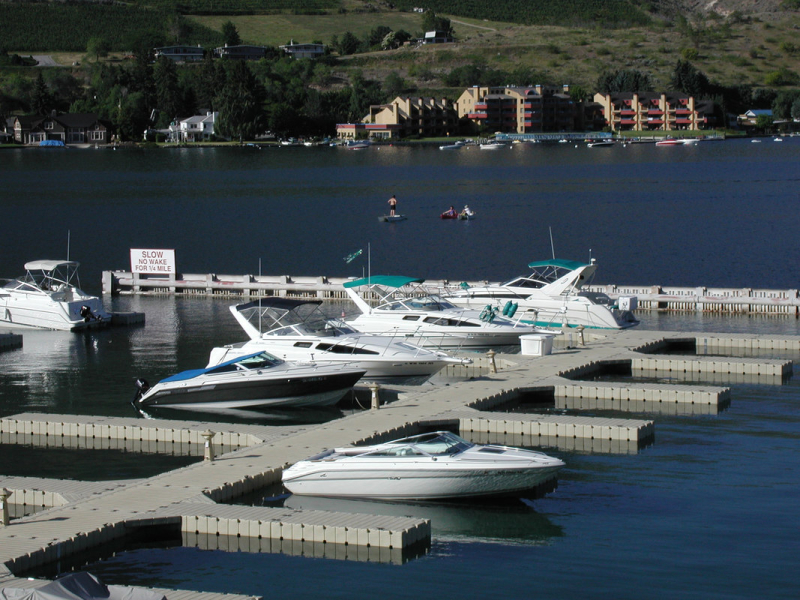 EZ Dock uses a UV-8 inhibitor in all of its products. These inhibitors range from UV-1 being the lowest protection to UV-8 being the largest protection. We also produce an extremely thick product (about 3/8" average thickness). The final defense against UV is the light tan color of the dock. How much maintenance can I expect with my EZ Dock? EZ Dock will provide a long-life of maintenance-free enjoyment. An occasional wash with soap and water is about all that is required to keep the dock looking new. What about anchoring my EZ Dock? EZ Dock offers several anchoring options to keep your floating dock safe and secure in all conditions. Pipes, deadweight anchors, and stiff arms are all anchoring options available to you. EZ Dock offers brackets and anchoring hardware to accommodate just about any lake conditions. Are the deck surfaces slick when they are wet? The EZ Dock surfaces have a non-skid texture molded into the dock sections. The docks also have grooves to channel the water away. These two items work together to provide safe footing, even when the deck surface is wet. Will the dock damage my boat or personal watercraft? EZ Dock is manufactured from low-density polyethylene that will not damage the finish on any boat or PWC. What about a gangway from the land to EZ Dock? EZ Dock offers wooden gangway kits, polyethylene gangways, and 3' to 5' wide aluminum gangways in lengths from 10' to 25'. What is the freeboard height for EZ Dock? Dock sections are 15" high and will draft about 2" of water resulting in a really nice 13" freeboard height. How is EZ Dock with the environment? 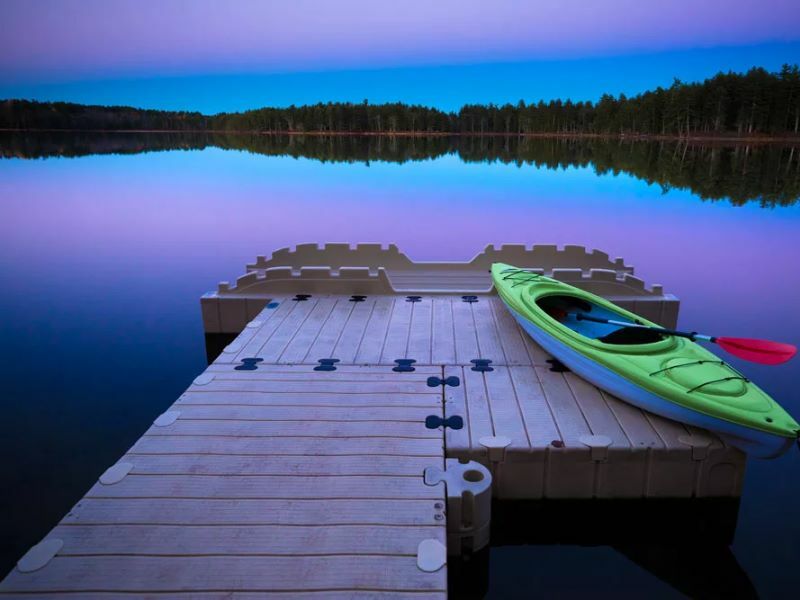 EZ Dock is just about the most environmentally friendly product that you can put on the water. Our dock sections do not rust, splinter, dissolve, or have any paint or chemicals that can harm the environment. How long has EZ Dock been around? Z Dock was started in 1989 by Jack Neitzke and Cliff Vierus. Jack owns a Harbor on the Mississippi near Winoma, MN and had decided to update his entire dock system. As he shopped around and looked at different brands and styles of docks, he felt that everything currently available required too much maintenance, had too many parts, was too difficult to install or change once installed, needed to be taken out in the winter, or was just plain too expensive. Well, Jack explained all this to Cliff, and the two of them set out to design a dock system, which would resolve those issues. 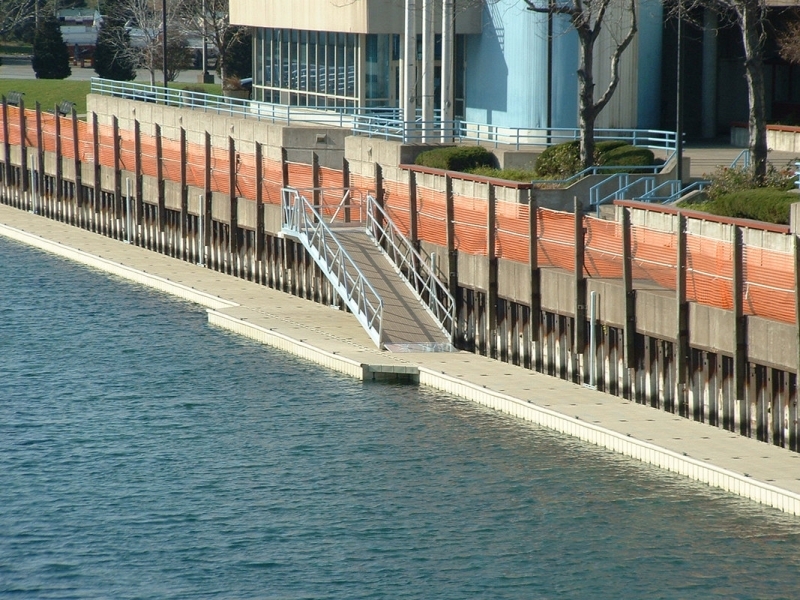 In 1991 the first EZ Dock prototype sections were rotational molded and went into use at Jack's Harbor. Today, those original 78 sections are still in use YEAR ROUND. If there isn't any foam in your dock sections, won't they sink if damaged? NO! The Composite Materials Center at Winona State University has performed various tests and measurements on the EZ Dock sections which prove that even if you took a chain saw and opened the dock sections from top to bottom the dock would only lower about 1.6" further into the water, the interior pylons would each continue to support about 55lbs apiece. This means that the smaller section could continue to support 330 lbs and the larger one would continue to support about 500lbs. Even if you flooded the interior pylons, it still won't sink under its own load because the density of the polyethylene is less than that of water. Why not use foam? Wouldn't that be simpler? While it would have been easier to build a float that contained foam, our advanced structural design has completely eliminated the need for foam. Simply put, our float doesn't need foam for structural integrity, flotation or for any other reason. Our decision to NOT use foam was based upon the advise we received from water use experts with several different State's Departments of Natural Resources, and others, like the U.S Army Corps of Engineers. Their concern was for the long range detrimental effects on the environment of foam which could potentially escape if a float is damaged. If your float/dock does become damaged, then what? First, consider that the average wall and deck thickness is anywhere from two to four times thicker than ordinary foam filled floatation devices. So, it's very unlikely that even under extreme conditions the EZ Dock float/deck would develop a leak. But, if it did, you would simply drain the water and repair the affected area with a heat source like a soldering iron. Aren't all floating docks tipsy and difficult to walk on, especially in waves? While there will always be a floating sensation on any floating dock, there are differences between dock designs. The EZ Dock being one long, continuous, float, reduces these effects considerably. Consider the fact that when you walk on a conventional floating dock which uses decking to span between floats, your weight is mostly concentrated on only one float which has about 13 square feet of water-to-float surface contact. But, when you walk on an EZ Dock your weight is distributed over a minimum of 35 square feet of water-to-float contact area. That's nearly 3 times more area! With regard to wave action, consider that the EZ Dock float/deck section, must because of its length and connection to other sections, rise to the top of waves and therefore bridges them. EZ Dock doesn't act like a sea serpent trying to be high and low at different points. Can I leave my EZ Dock in for the winter? Ice, and extreme cold weather do not affect the EZ Dock float/deck. The polyethylene remains flexible to -90 degrees Fahrenheit and the floats are only drafting about 1.5" of water, meaning that ice pressure will force the float upward, not inward. If you know however that there will be an ice pressure push affecting your installation, we recommend that you remove the pipes or pilings so that the pipes won't be bent by that force. Is the walking surface slippery? EZ Dock float/decks have a special thread pattern which provides good traction when they're dry. When they're wet, the adhesion factor actually increases. Polyethelyne is not a good heat conductor. That, and it's lighter color help to keep your EZ Dock cool to the touch. It has been said that there are two costs involved with any purchase. The initial cost to buy a product, and the cost of ownership. While there may be other systems available for less money, there are certainly just as many available for more money as well. We never intended for the EZ Dock system to be the cheapest to buy, only the least expensive to own! Our design provides for a long (25 to 30 years expected) and trouble free (rubber couplers provide for flexing and eliminate component fatigue) lifetime of usage. What is the warranty provided by EZ Dock? EZ Dock provides an 8 year warranty on the floating docks (see warranty). If a dock section should fail due to a manufacturing defect the dock is replaced with a new dock, not a prorated amount but a new replacement dock. EZ Dock provides extended warranty services for up to twenty years based on customer requirements.